Image from ‘The Dirt’ website. 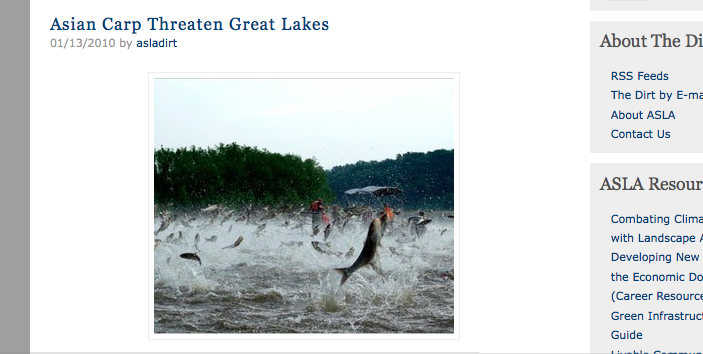 In ASLA’s blog ‘The Dirt’, a recent posts highlights the efforts for the State of Michigan to protect Lake Michigan and the entire Great Lakes Region from the Asian Carp. Like all invasive species these fish take over an ecosystem by consuming resources that would otherwise be used by the native species. Michigan is suing the State of Illinois in order that they shut down the waterways leading into Lake Michigan. According to the New York Times article Minnesota, Ohio, Wisconsin, and Indiana are all in support. This came to light due to recent evidence of the carp within 6 miles of Lake Michigan in the Chicago area waterway system that links the Mississippi River to the Great Lakes. And while the City of Chicago realizes that the carp overtaking Lake Michigan would be devastating they are wrestling with their own economic concerns over what closing the waterways would really mean. There is more detailed information in ‘The Dirt’ post and the New York Times Article. Another item in the light recently is the efforts of the Chicago Botanic Garden and the Morton Arboretum to gather native seeds from around the Midwest. “Scientists from the botanic garden are sending teams out across the Midwest and West to the Rocky Mountains and Great Basin to collect seeds from different populations of 1,500 prairie species by 2010, and from 3,000 species by 2020. The goal is to preserve the species and, depending on changes in climate, perhaps even help species that generally grow near one another to migrate to a new range.” The idea is to catalogue, store and preserve native plants in the event that climate change or invasive species may require the migration of native plant materials to other areas. There is still much debate about the project and more detailed information can be found in the New York Times article. These are just two examples in a long list of invasive species problems that continue to threaten the ecosystems of the US. Not only do invasives disrupt plants, animals and other natural resources, but as noted above they also can have huge negative economic impacts. This coming on the tails of National Invasive Species Awareness Week, (January 10-14th), to learn more visit the National Invasive Species Information Center’s website. I recently returned from a relaxing week long family vacation in Rosemary Beach, Florida, located on the panhandle just west of Panama City Beach. For those of you not familiar, this is a traditional neighborhood development established in 1995 complete with a Town Center that includes a post office, retail and restaurant space, a hotel, neighborhood parks and more. Many people choose to spend their vacation here for obvious reasons: sun, sand, surf and swimming pools but let’s review what visitors may not notice during their stay. As stated, the streets are constructed of pervious concrete, which allows stormwater from frequent rain showers to penetrate through the pavement and directly into the sandy soil base rather than sheet drain to the typical/conventional system of numerous curb and gutters, inlets and concrete pipes. This isn’t to say there aren’t any storm sewer pipes as part of the infrastructure, just less because of an alternative stormwater solution. The average person visiting Rosemary may only notice that the driving surface is not asphalt and is more ‘bumpy’ that typical concrete. In addition to pervious concrete, the use of native vegetation is another sustainable site strategy. Using native vegetation requires less water and maintenance while supporting bio-diversity of local wildlife species. Sidewalks, neighborhood boardwalk paths and parks are lined with plants that seem to have been there prior to development and give the impression that the buildings were somehow built around them. Live Oaks create a dramatic tunnel effect over the sidewalks while providing habitat for wildlife such as birds and squirrels. Lizards appear to love hanging out under the low growing palm shrubs and other native plant material. The careful planning of plant material size, location and scale of streetscape planting also aids in the slowing of motorist traffic by psychological affect. These are only two simple sustainable site strategies/design elements that may go unnoticed by the typical visitor but could serve as an example of how to develop in the future. By the way, I did have fun and relax with my family and didn’t spend they whole week analyzing better ways to develop.